MISSION, KS--(Marketwired - Apr 14, 2015) - (Family Features) Storage has style? Really? Of course it does. And when it comes to tackling storage projects, don't skimp on creating the style that best suits your personality. "Creative, attractive and functional storage can give any home a refreshing lift," says Scott Davis, ClosetMaid's VP of Product Development and Marketing. 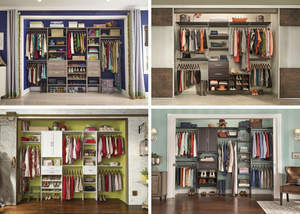 "Whether it's a master closet, linen closet, entry way closet or simply decorative storage, select a style that reflects you." 1. Quick -- you're boarding a plane to Europe. Where's it heading? 2. Your dining table is begging for a flower arrangement. What kind? 3. It's not just date night -- it's the perfect date night. What's yours? 4. Pretend you're a musician in an orchestra. What's your section? 5. What's your favorite holiday? Clean lines, immaculate style and a fashionable and highly functional place for everything. That's the essence of modern style. To be classic means understanding that it's not about always being in style, it's about never going out of style.